Hob y Deri Dando is the refrain of an old song of the Druids used to call the people to religious gatherings in the groves. It is likely that the English song, "Hie down, derry down" is derived from the same source. An invitation to the Oaken Groves was usual with lovers in former times as was the custom of driving the hogs to feed on acorns. 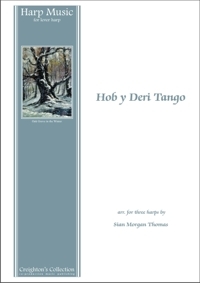 The tune has two versions, one in South Wales, another in North Wales, and there seems to be no end to the number and variety of verses, both Welsh and English, not necessarily translations. The recurrent theme is that of unrequited love. The Tango is an extra variation - just for fun! Hob y Deri Dando is the refrain of an old song of the Druids used to call the people to religious gatherings in the groves. It is likely that the English song, "Hie down, derry down" is derived from the same source. An invitation to the Oaken Groves was usual with lovers in former times as was the custom of driving the hogs to feed on acorns. 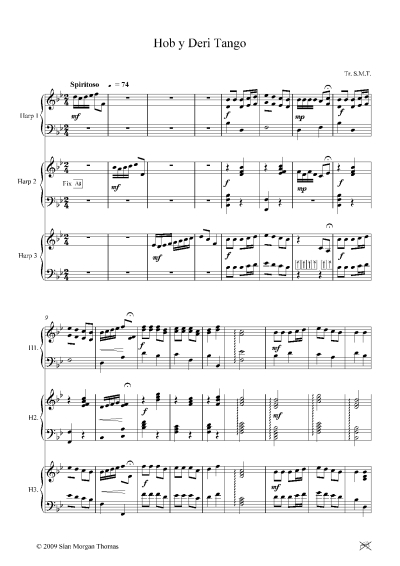 The tune has two versions, one in South Wales, another in North Wales, and there seems to be no end to the number and variety of verses, both Welsh and English, not necessarily translations. The recurrent theme is that of unrequited love. The Tango is an extra variation - just for fun!